Have you ever botched an important meeting? Forgot something for your kid? Blow a race? Were late to an important event? Said something stupid? Overslept? Forgive yourself. Welcome to this thing called life. It happens. On Friday I had an internal interview for my next role. My performance was less than stellar. It wasn’t just bad. It was downright awful. It reminded me of my 2011 New York Marathon. After my daughter Ally was born I wanted to continue my journey to run the Five World Major Marathons. I was accepted to New York on the Team for Kids. I trained as a new mom, running 3-4 times a week, and traveling for work 40%. Training was tough. At 30 pounds heavier, the summer was hard but I made it through. Halloween came and I became really ill. Ally gave me some god-awful virus that landed me in the hospital for observation…10 days prior to the race. When the doctor cleared me, I decided to fly to NY and run. The weather was beautiful, sky clear and it was a next to perfect day to run a marathon. I ran 16 very healthy miles. And then the wall came. I just froze. My legs locked up, my stomach got tight, and my body began to shut down. The last 10 miles were the longest and most painful I had ever endured. But, I finished. In 6:28, just 2 minutes under course time limit, I crossed the finish line. It was dark, I was cold, but I did it. Life is not perfect. It doesn’t come easy. We aren’t going to score, win or deliver on the mark every time. We are human. And that’s okay. Stop beating yourself up. 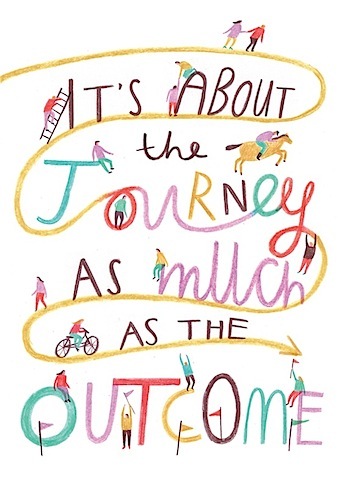 It’s about the journey, as much as the outcome.